Consider the inner planes, fire and water, earth and air, the negative and the positive. Opposing ends of axes running through the material, each point a vertex of a “octahedron” to use the scholar's term. The energies of these planes, lying so close to the material, power it, give it vigor and energy and at the same time death and destruction. The races of the prime have known this for ages immemorial. But these six elements are not the only energies of the multiverse. The elements sustain or destroy life, but life itself is separate. The tribal peoples of the prime have always stood in awe of the elements, but their worship is almost universally for their ancestors, for life. Incarnum, the magic of life, is perhaps the most intuitive magic of all, and in many tribes, incarnum and the ancestors were the vehicle for bringing the fury of the elements to bear. Though given as many names as there were tribes, the Shaman remains a fixture of tribal life, often a leader both spiritual and martial, protecting his people and conquering their enemies. As a Shaman, you are a leader of your people, both a spellcaster and a spiritual guide. You call upon your ancestors — in the form of incarnum — in order to wield the elements. You are in many ways a hybrid between meldshaper and spellcaster: you do not shape or bind soulmelds, but you do gain Essentia, and your magic is not so static as the discrete spells of the traditional spellcaster. As a kind of meldshaper, Constitution is important; as a kind of spellcaster, Wisdom is important. Shamans are made of tougher stuff than most spellcasters, but still are not typically found on the front-lines, making Strength and Dexterity less important. As Shamans are often leaders or advisers, Charisma or Intelligence may be important, but these ability scores are not directly tied to their class features. Races that gravitate towards the Shaman class are those that are primitive and tribal in nature. Dusklings, given their natural talent with Incarnum, are Shamans often enough, though most prefer Totemist. Meanwhile, among tribal Dwarves, Halflings, and Gnomes, where Totemists are rare to completely unheard of, Shamans are much more common. Primitive Humans and Elves have Shamans about as often as Totemists, though Druids are more common than either among these races. Of special note, Shamans are extremely important members of many Orcish tribes, and Shaman is often a desirable position for a Half-Orc within an Orcish tribe, since they tend to be wiser than their pure brethren. Also, though somewhat unusual, there is no reason why a perfectly civilized, even urbane, Shaman could not exist: the knowledge is out there, and one could study the ways of Shamanism as easily as the ways of Wizardry, for example. The association of Shamans with primitive cultures, however, dissuades many from doing so. It is all but unheard of for a Shaman to hail from any plane aside from the Prime Material. The Inner Planes' special relationship around the Prime are the source of the Shaman's methods for calling on the elements; it is literally the structure of the planes that leads to the development of Shamanism. That said, all of a Shaman's abilities may be used on any plane, so in theory Shamans could hail from any plane; it is just exceedingly unlikely for a native of another plane to see the Inner Planes the way someone from the Material does. Shamans are devoted to their ancestors and to the primal energies around them. Most Shamans are paragons of their own race, and therefore most Shamans will simply share the alignment of their own tribe — in fact, the Shamans of a tribe are often charged with maintaining that alignment in the tribe. If not in this role, Shamans are usually Neutral — revering, as they do, the natural world, they consider morals and ethos pretentious delusions. Of special note are the Elements of the Positive and Negative Energy Planes. A Shaman would not view these as inherently Good or Evil, the way a Cleric does. For a Shaman, life and growth are as natural — and therefore “good” — as death and even undeath. Unlike even most Druids, who see the Undead as anathema to nature, Shamans see all six elements as the basis for all nature, and all six having a place. (4 + Int per level; ×4 at 1st level) Class Skills: Appraise (Int), Autohypnosis (Wis), Concentration (Con), Craft (Int), Decipher Script (Int), Diplomacy (Cha), Gather Information (Cha), Heal (Wis), Intimidate (Cha), Knowledge (Arcana) (Int), Knowledge (Geography) (Int), Knowledge (History) (Int), Knowledge (Local) (Int), Knowledge (Nature) (Int), Knowledge (Religion) (Int), Knowledge (the Planes) (Int), Listen (Wis), Profession (Wis), Ride (Dex), Sense Motive (Wis), Spellcraft (Int), Spot (Wis), and Survival (Wis). A Shaman adds Auran, Aquan, Ignan, and Terran to her list of bonus languages due to race. She knows one of these automatically, and may learn the others for a single skill point each, rather than two each as normal for Speak Language. 1 Due to Master of the Elements class feature; has restrictions. Shamans are proficient with simple weapons, and with light armor (but not with shields). A Shaman utilizes the six elements dilineated by the Inner Planes: Air, Earth, Fire, Negative, Positive, and Water. Each functions similarly to a Soulmeld in that it may have Essentia invested in it, and may be bound to a Chakra. However, unlike Soulmelds, the Elements do not need to be shaped each day, nor must the Shaman pick between them: all Shamans always have all six available. They do not count towards the usual limit of Soulmelds shaped based on one's Constitution score. Further, they do not occupy a Chakra at all unless they are bound to one, and unlike Soulmelds, each of the elements may be bound to any Chakra (except those the Shaman never gains access to, namely the Totem and Soul Chakras). Finally, the elements are not Soulmelds that may be chosen with the Shape Soulmeld feat. At 1st level, a Shaman gains access to her personal pool of Essentia, which can be invested into each of the six elements as well as into any Spells that she shapes (see Spellshaping, below). Her Essentia pool's size is indicated by the Essentia column of Table 1: The Shaman (plus at least 1 bonus Essentia from her Incarnum Spellshaping feat; see below), while her Essentia capacity is given in Table 2‒1: Essentia Capacity on page 19 of Magic of Incarnum. As a Swift Action, she may reallocate her Essentia investments (see Essentia, Magic of Incarnum pg. 50). Having an Essentia Pool means that the Shaman also gains the Incarnum subtype. The Incarnum subtype has no inherent effects, but it does identify Shamans as vulnerable to certain effects that target Incarnum creatures. A Shaman "shapes" Divine Spells, which is similar to casting them, but subtly different in important ways. For the sake of the effects of her abilities and for prerequisites, she has both a Divine Caster Level and a Meldshaper Level, which are both always equal to each other and equal to her class level (plus any bonuses to either or levels in class that advance either; see Prestige Class Note below). Unlike most Spellcasters, a Shaman does not have a limited number of Spells that she may cast in a given day. Due to the nature of Essentia, she is free to recycle energy from previous spells into new ones. She is, however, limited in how many concurrent effects she may shape, as listed in Table 1: The Shaman under the Shaped column. A Shaman gains additional concurrent spells for having a high Wisdom score, but rather than gaining one additional concurrent Spell per Spell Level listed in Table: Ability Modifiers and Bonus Spells, she gains one additional concurrent Spell of up to the highest level she would gain one of, and then another of up to the highest level she receives two of, and so on. Thus, for example, a Shaman with 20 Wisdom would be able to shape one additional concurrent Spell of up to 5th level (assuming she could cast Spells of a level that high to begin with), and a second additional Spell of up to 1st level. However, a Shaman may not shape Spells (or Soulmelds, if she has that ability) in greater number than her Constitution score - 10, as normal for Soulmelds. Her spell's DCs are given by 10 + the Spell's level + the Shaman's Wisdom modifier. In order to cast a given Spell, its level must not exceed a Shaman's Maximum Spell Level, as listed in Table 1: The Shaman, and she must further have a Constitution score equal to 10 + the Spell's level. In general, a Shaman, unlike many other Spellcasters, does not prepare or learn specific Spells; she simply knows all of her Spells that are derived from the six elements, and may use them spontaneously. However, many of her Spells derive not from a single element, but from a combination of elements. There are twenty such combinations: twelve pairs and eight triples. She may prepare one combination (pair or triple) per class level each day, so that by 20th level she may prepare all of them every day and have access to all of her Spells at once. Preparing elemental combinations takes place during the same hour in which Chakra Binds are chosen (see below). Of special note, triples, or combinations of three elements, may only be prepared if all three pairwise combinations of those elements are also prepared. For example, in order to prepare the Destiny triple of Air, Fire, and Positive, she must first also prepare the Courage pair of Fire and Positive, the Light pair of Air and Positive, and the Lightning pair of Air and Fire. When a Shaman shapes a Spell, Essentia from the element(s) it is based on is moved from those elements to the Spell itself. The amount of Essentia moved to the Spell is up to the Shaman: every Spell has a minimum required investment of Essentia, but beyond that she may invest Essentia up to the Spell's capacity. The Essentia moved to the Spell must come from the Essentia previously invested in the element(s) it is based on, however. The Spell itself becomes an Essentia receptacle much as a Soulmeld, but unlike a Soulmeld it must have at least as much Essentia invested in it as shown in its minimum. A Shaman may invest or divest Essentia from an ongoing Spell as normal for rearranging Essentia, but if the Spell is left with less Essentia than its minimum, it immediately ends and any Essentia remaining in it is returned to the Shaman. The capacity of a Spell is equal to the largest capacity from among the element(s) it is based on. If it derives from a pair of elements, its capacity is further increased by 1, and derived from a triple, the capacity is instead enhanced by 2. Finally, a Shaman may use Metamagic; like a Sorcerer, however, her casting times are lengthened whenever she chooses to do so. She must be able to cast a Spell of the Spell's new level. Further, when a Shaman wishes to use a Metamagic Feat, while casting she must invest Essentia in the feat itself (as with Incarnum feats); this Essenita must come from the Spell's base element(s), and the feat has a capacity like that of a Soulmeld. The Essentia is trapped in the feat until the affected Spell ends, at which point the Essentia is returned to her. She may only invest Essentia in a Metamagic feat while shaping a Spell that uses it. At a site sacred to your tribe or people, you may enact a rite to contact your ancestors and seek their advice or aid. This ritual requires 24 hours of meditating and praying, and the ancestors do not — or perhaps, cannot — always answer, but when they do they are usually helpful and they tend to be knowledgeable, especially on matters of the history of the tribe and the lands that it has inhabited. At the very least, they can offer some divine spells to aid you, particularly to cure ailments like curses or diseases. They can even bring back the dead, as with a Raise Dead, Resurrection, or even True Resurrection spell, but you must provide any material or experience components. In general, your ancestors have access to all Cleric and Druid spells, but will only be willing to use those that a Cleric or Druid of your class level could, and even then only when it seems necessary to them (most commonly, the removal of dire or permanent afflictions). They can and are willing to cast such Spells on any who are present during the ceremony, provided they are respectful. Even if you are courteous and do not abuse the privilege of contacting them, and bring all that they require, however, they may still refuse or require that you go on a quest for them (complete with a Quest Spell to make this binding) before they will help you. In general, for things like simple questions, especially questions that the ancestors can readily answer (of or relating to the tribe itself, for instance), or for casting spells like Remove Curse or Remove Disease that have no material or experience components and are deemed necessary, the ancestors can be counted on at least once a month, even if you have left your tribe behind and are not acting in their interests, provided you haven't actively betrayed them. More than that depends on their generosity and how much they feel you are acting in the tribes' best interests, or how much they think helping you will be in the tribe's best interests. If you have actively betrayed your tribe, however, they may not answer at all, or take the opportunity to curse you (as with Bestow Curse) themselves. However, if you are particularly humble in begging for their forgiveness, they may be willing to cast an Atonement Spell on you to rectify this: this will almost always come with a Quest Spell first, however, and in any case costs you 500 XP. All Shamans gain Incarnum Spellshaping (Magic of Incarnum pg. 38) as a bonus feat, even if they do not qualify for it. Hence, their Essentia pool is actually at least 1 greater than as listed on Table 1: The Shaman, thanks to the Essentia granted by that feat. Like a Meldshaper, a Shaman gains the ability to bind each of the elements to her Chakras, starting at 2nd level. Every Element may be bound to every Chakra (except Totem, since the Shaman does not gain the Totem Chakra). A Shaman opens each Chakra at the levels listed in Table 1: The Shaman. See page 51 of Magic of Incarnum for more information on binding Chakras. Binding Chakras takes an hour, which is done during the same hour as preparing elemental combinations. Beginning at 3rd level, the Essentia capacity of any element bound to a Chakra increases by 1. A 5th level Shaman is a thing that your ancestors can be proud of, and take an interest in. One of your ancestors comes to watch over you. He or she is a diminutive, incorporeal, Undead creature with a Flight speed of 20 ft. with Perfect maneuverability. It is invisible and inaudible to all but you, though True Seeing or the like will see it. It has the same number of HD as you, with 1 HP per HD. It has 13 AC (13 Touch, 12 Flat-footed) and saves equal to your own. It is immune to area-affecting spells and effects and also has Turn Resistance 4 as extraordinary abilities. If rebuked, it simply disappears, returning to the ancestors rather than be used against the tribe; treat this as if it had been destroyed. It has no ability to make attacks or otherwise affect the outside world. It has no feats, but has maxed cross-class ranks in Knowledge (History), Knowledge (Local), Knowledge (Nature), Knowledge (Religion), Listen, and Spot. Its ability scores are Str —, Dex 13, Con —, Int 13, Wis 15, Cha 11. You do not control your ancestor spirit, it merely accompanies you. It will not go scouting for you. While you sleep, it follows you into your dreams, or else returns to the ancestors to discuss your progress; it will not pull guard duty for you, either. However, having the Ancestral Guide around does give you another pair of eyes; you gain the benefits of the Alertness feat so long as it remains within 30 ft. The Ancestral Guide typically does stay within 30 ft. of you. If 'killed', 'destroyed', or 'banished', your Ancestral Guide will return in 2d4 hours of its own accord. If your ancestors feel you have betrayed your tribe, you will not receive a Ancestral Guide. If you later betray your tribe, your Ancestral Guide will leave you. If you receive Atonement from your ancestors, then your ancestral guide will return. As long as your Ancestral Guide is with you, you may use Ancestral Counsel anywhere, rather than only being able to use it at a site sacred to your tribe. Beginning at 6th level, a Shaman may spend a full-round action to change which Elemental Combinations she has prepared, as if doing so for the first time that day. Any Spells she currently has shaped that require any Elemental Combinations that she no longer has prepared end immediately, and their Essentia is returned to her. After using this ability, she may not do so again until she next prepares her Elemental Combinations and Chakra Binds normally; that is, she may use this ability once per day. At 10th and against at 16th, she gains another daily use of this ability. These uses still refresh each time she prepares her Elemental Combinations and Chakra Binds normally. Beginning at 8th level, a Shaman may spend a full-round action to change which elements are bound to which Chakras. She may change any and all of them, as if she were binding them for the first time that day. After doing so, she may not do so again until she next prepares her Elemental Combinations and Chakra Binds normally; that is, she may use this ability once per day. At 12th and against at 18th, she gains another daily use of this ability. These uses still refresh each time she prepares her Elemental Combinations and Chakra Binds normally. By 10th level, your prowess with spellshaping and your closeness with your ancestors allows you to cast spells through your Ancestral Guide, so long as it is within 30 ft. Whenever you shape a Spell, you may treat the point of origin of the Spell to be the Ancestral Guide, rather than you. The Ancestral Guide can touch others for Touch-range Spells, but it has no Reach so it must be in the target's square. For all other purposes, you are the shaper of the Spell. You still provoke an Attack of Opportunity while using a Spell in this fashion (unless you cast defensively, as normal). In combat, your Ancestral Guide will typically be accommodating in its position so that this ability may be used. Beginning at 15th level, your Ancestral Guide begins to more actively help you in your quest, though it still will not stray far from you. You may shape a Spell, as normal, except that you send the Spell to your Ancestral Guide, who holds onto it, Essentia and all, until you want it used. None of the Spell's effects take place, nor does any time that passes count towards its duration. You can reallocate Essentia to and from the Spell as normal, but it ends if you do not leave enough for its minimum investment. Your Ancestral Guide can hold one such Spell at a time, and it still counts against your limit of concurrent Spells shaped. On your turn, at your command or if you are unable to give the command but it thinks that you would if you could, it releases the Spell. It may also be given directions on when to release the Spell, though how well it understands those directions or whether or not it will obey them depends on the instructions themselves, the ancestor in question, and the Shaman's relationship with it. The Ancestral Spirit is the point of origin for the Spell, but it is otherwise as if you had shaped it. It is shaped with however much Essentia the Ancestral Spirit was given to hold at the time. This does not cause you to provoke an Attack of Opportunity, and does not require any action on your part, but the spirit itself does provoke. At 20th level, a Shaman may prepare every Elemental Combination. Her uses of Recombine Elements become additional daily uses of Rebind Chakras. In addition, she may bind each Element to a Chakra in a day, even though this exceeds her ordinary maximum of 5 Chakra Binds. However, this uses all 5 Chakra Binds, and she must bind all 6 Elements: if she has access to Soulmelds (through the Shape Soulmeld feat, perhaps), she may not bind it to a Chakra without giving up the ability to bind all of the Elements (and her number of Chakra Binds is still limited to 5). If she has other sources of Chakra Binds, she may continue to use those as normal for Soulmelds without affecting her ability to use this feature. Further, she becomes adept at travel through the harsh environments of the Inner Planes. She gains a Flying speed with Perfect maneuverability, a Burrow speed, a Climb speed, and a Swim speed, all equal to her Land speed (this does not stack with other features that give such speeds; simply use the faster speed in each category if applicable). She also becomes immune to all harmful effects of any plane she inhabits, and may extend this benefit to any allies to whom she has line of effect. Finally, her type changes to Outsider, with the Air, Earth, Fire, Incarnum, Native, and Water subtypes. She does not gain the Extraplanar subtype on the Material Plane, and planes coterminous with the Material (e.g. Ethereal, Shadow), or on any of the Inner Planes. All banishment or calling effects affect her only if she is willing. Negative and positive energy both heal her or benefit her, treating her as living or undead based on whichever is most beneficial to her. You are now welcomed among the ranks of your ancestors, and your name and your stories will be cherished by your tribe for all time, provided you haven't betrayed them. You are, in fact, too great an ancestor to be given the lowly duty of serving as a Shaman's Ancestral Guide; you effectively "out rank" your own Ancestral Guide. He or she will now be far more amenable to helping you, even in mundane matters like scouting or watching the camp while you sleep. Further, when you use your Ancestral Counsel ability, you have the right to demand as much support as your ancestors are capable of giving: they will not hinder you with needless quests or other petty requirements. They will still need any material or experience components of any Spells you request of them, but they will be happy to provide them as often as needed as long as you do. Image adapted from Naya Battlemage by Steve Argyle. All credit to him for the image. Each of the elements has a basic effect when Essentia is invested in it, and enhanced effects when it is bound to a Chakra, just like soulmelds. However, on their own, the elements are generally not as impressive as Soulmelds: their real power lies in their ability to allow a Shaman to shape Spells. Basic Effect : A Shaman may hold her breath for another 2 rounds per point of Essentia invested in the Element of Air before needing to make Constitution checks. For every 2 Essentia, she may make 10 cu. ft. of air last indefinitely for one creature or significant fire source. Crown : The Shaman gains a +4 bonus to Climb and Jump skill checks. She gains an additional +2 bonus to each per Essentia invested in the Element of Air. She also keeps her Dexterity bonus to AC while climbing. Feet : The Shaman may use Air-based spells and abilities without them being impeded by planes which impede such magic (such as the Elemental Plane of Earth), and may set her “down” direction while in subjective gravity planes without needing to make a Wisdom check. She may extend these benefits to one creature to whom she has line of effect per point of Essentia invested in the Element of Air. Hands : The Shaman gains the ability to Turn or Destroy Earth creatures as a Good Cleric of her Meldshaper Level turns Undead, and the ability to Rebuke, Command, or Bolster Air creatures as an Evil Cleric of her Meldshaper Level rebukes Undead. However, she uses Constitution instead of Charisma when using this ability. To use either ability, she must have a number of points of Essentia invested in the Element of Air equal to the number of previous times she has used either ability that day. Arms : The Shaman adds +1 per point of Essentia remaining in the Element of Air to the saving throw DCs, if any, of Spells that are cast using Essentia from the Element of Air. Brow : The Shaman gains the effects of the Touchsight power, but out to 10 ft. per Essentia invested in the Element of Air. Shoulders : The Shaman gains a Fly speed with Good maneuverability. Its speed is 20 ft. per Essentia invested in the Element of Air. If no Essentia is, she may hover in midair, but not move herself (except down by falling, which she may control to be as much slower than free fall as she likes). Throat : The Shaman gains a breath weapon that affects a 60 ft. line as a Standard Action. It deals 10d4 Sonic damage, DC 10 + half her Meldshaper Level + her Constitution modifier Reflex save halves. For each Essentia invested the Element of Air, the damage increases by 2d4. Those who fail the Reflex save are also blown back by 5 ft. for every 5 by which they failed the save. Once used, she must wait 1d4 rounds before using this breath weapon again. Waist : The Shaman becomes immune to the effects of Spells and abilities that have the Air descriptor (or are based on a Spell that has that descriptor), and further becomes immune to the effects of winds in general. This affects not only herself, but also her equipment and even her attacks: an arrow shot by a Shaman with the Element of Air bound to her Waist would fly true straight through a Wind Wall spell. Heart : The Shaman becomes surrounded by a raging whirlwind. This cylinder of circling winds is 200 ft. tall, and has a radius equal to 5 ft. per Essentia invested in the Element of Air. All creatures within are treated as being within a tornado, except the Fortitude DC to avoid being sucked up by it is 10 + half the Shaman's Meldshaper Level + her Constitution modifier, and the size of creature that is affected depends on how much Essentia is invested (i.e. how large it is). To be checked, the radius of the storm must be equal to the creature's space; to be knocked down, the radius must exceed the creature's space by 5 ft., and must exceed the creature's space by 10 ft. in order to qualify for Fortitude saves vs. being sucked up. The Shaman is unaffected by the winds, as are her ranged attacks. As a magical windstorm, it is visible but does not provide enough opacity to cause Concealment or break line of sight. Basic Effect : A Shaman gains a +2 bonus per point of Essentia invested in the Element of Earth on saving throws to avoid damage from starvation. Crown : The Shaman gains a +4 bonus on checks to avoid being Bull Rushed, Overrun, or Tripped. She gains an additional +2 bonus to each per Essentia invested in the Element of Earth. She may also avoid losing her Dexterity bonus to AC while balancing as if she had 5 ranks in Balance, though she gains no bonus to that skill. Feet : The Shaman may use Earth-based spells and abilities without them being impeded by planes which impede such magic (such as the Elemental Plane of Air). She may also ignore the crushing effects of being within entirely-solid spaces (such as the Elemental Plane of Earth, or by simply being buried), and may breathe normally while so entombed. This does not give her the ability to tunnel through them, however. She may extend these benefits to one creature within Medium range of her per point of Essentia invested in the Element of Earth. Hands : The Shaman gains the ability to Turn or Destroy Air creatures as a Good Cleric of her Meldshaper Level turns Undead, and the ability to Rebuke, Command, or Bolster Earth creatures as an Evil Cleric of her Meldshaper Level rebukes Undead. However, she uses Constitution instead of Charisma when using this ability. To use either ability, she must have a number of points of Essentia invested in the Element of Earth equal to the number of previous times she has used either ability that day. Arms : The Shaman adds +1 per point of Essentia remaining in the Element of Earth to the saving throw DCs, if any, of Spells that are cast using Essentia from the Element of Earth. Brow : The Shaman gains Tremorsense out to 20 ft. per Essentia invested in the Element of Earth. At-will as a Free Action, the Shaman may reverse the opacity of solid and gaseous objects before her eyes: she is able to see through solid objects with a Hardness less than 20 as if it were clear air, but actual air or other, normally transparent gases become completely opaque. Unless she is literally immersed in solid material, this effectively blinds her, but can be useful in conjunction with other abilities that allow her to burrow. Shoulders : The Shaman gains a Climb speed equal to her Land speed, and gains a bonus on her Land speed equal to 20 ft. per Essentia invested in the Element of Earth. Throat : The Shaman gains a breath weapon that affects a 30 ft. cone as a Standard Action. It deals 10d6 Dessication damage, DC 10 + half her Meldshaper Level + her Constitution modifier Reflex save halves. For each Essentia invested in the Element of Earth, the damage increases by 2d6. Once used, she must wait 1d4 rounds before using this breath weapon again. Waist : The Shaman becomes immune to the effects of Spells and abilities that have the Earth descriptor (or are based on a Spell that has that descriptor), and further may ignore difficult terrain of all forms. Finally, her own square and all squares adjacent to her are considered difficult terrain for other creatures. Heart : The Shaman can literally cause the earth to rise up beneath her feet, or spontaneously form beneath them even in the most airy of areas. She effectively has a “Flight” speed with Average maneuverability equal to her Land speed, but she is actually just walking as the earth rises to meet her. If she is within 50 ft. per point of Essentia invested in the Element of Earth of an unworked earthen or stone surface, she may cause the earth to rise up to meet her feet, leaving a wall of stone and earth. Otherwise it forms as a simple bridge of earth and stone, appearing from mid-air if necessary. Either form crumbles away behind her a round after it was made (unless she is still standing there), dealing damage as a falling object to those in the squares directly beneath it or adjacent to those squares. Basic Effect : A Shaman may stand comfortably in heat 10° hotter than normal per point of Essentia invested in the Element of Fire. Crown : The Shaman gains a +4 bonus to Diplomacy and Perform skill checks. She gains an additional +2 bonus to each per Essentia invested in the Element of Fire. She may also make a rushed Diplomacy check (as a full-round action) with no penalty. Feet : The Shaman may use Fire-based spells and abilities without them being impeded by planes which impede such magic (such as the Elemental Plane of Water). She also becomes immune to even supernatural ambient heat, including the fire damage of fire-dominant planes, though she does not gain any protection from actual flames or fire-based attacks. Further, any objects she carries or attends are protected from the spontaneous ignition effects of fire-dominant planes. She may extend these benefits to one creature to whom she has line of effect per point of Essentia invested in the Element of Fire. Hands : The Shaman gains the ability to Turn or Destroy Water creatures as a Good Cleric of her Meldshaper Level turns Undead, and the ability to Rebuke, Command, or Bolster Fire creatures as an Evil Cleric of her Meldshaper Level rebukes Undead. However, she uses Constitution instead of Charisma when using this ability. To use either ability, she must have a number of points of Essentia invested in the Element of Fire equal to the number of previous times she has used either ability that day. Arms : The Shaman adds +1 per point of Essentia remaining in the Element of Fire to the saving throw DCs, if any, of Spells that are cast using Essentia from the Element of Fire. Brow : The Shaman gains the effects of the Arcane Sight spell, but out to a radius of 20 ft. per Essentia invested in the Element of Fire. Shoulders : The Shaman gains the ability to teleport up to 5 ft. per Essentia invested in the Element of Fire as a Standard Action. She may bring a number of willing creatures that she touches (or who are linked together by touch) equal to the Essentia invested in the Element of Fire. Throat : The Shaman gains a breath weapon that affects a 60 ft. line as a Standard Action. It deals 10d10 Fire damage, DC 10 + half her Meldshaper Level + her Constitution modifier Reflex save halves. For each Essentia invested in the Element of Fire, the damage increases by 2d10. Once used, she must wait 1d4 rounds before using this breath weapon again. Waist : The Shaman becomes immune to the effects of Spells and abilities that have the Fire descriptor (or are based on a Spell that has that descriptor). Further, any fire damage she would take (ignoring the above immunity) instead heals her. Heart : The ambient temperature around the Shaman soars. In an area within 5 ft. per 2 Essentia invested in the Element of Fire, the temperature is literally burning: it is the nearly the temperature found on the Plane of Fire. Creatures within this area take 3d10 Fire damage per round. All metal objects are affected as if by the Heat Metal Spell. Flammable objects may ignite, as on a fire-dominant plane. Protection against mere heat is insufficient; actual resistance or immunity to fire is necessary. In a radius 5 ft. per Essentia, the heat is “merely” unearthly: creatures without serious protection from heat take 1d6 lethal and 1d4 nonlethal damage per round (no save) from heat alone, and metal objects still take the effects of the Heat Metal spell. At 10 ft. per Essentia, there is extreme heat, which deals 1d6 lethal damage per minute (no save) and 1d4 nonlethal damage per 5 minutes (DC 15 + 1 per previous check Fortitude save negates); beyond this it can still be uncomfortably hot, but not enough to damage creatures without prolonged exposure. Those who take nonlethal damage from heat suffer from heatstroke and become fatigued. The Shaman herself is unaffected by this heat. Due to the way the Shaman casts Spells, she must invest Essentia in the Element of Fire before casting a fire-based spell; if, in a single turn, she increases her investment in the Element of Fire but then immediately decreases it again by casting a Spell, there is a noticeable spike in temperature in the affected areas, but it is too brief to cause damage. 5-ft./2-Ess +200°F Burning Heat: As on a fire-dominant plane. 3d10 Fire damage per round, Heat Metal effect on metal objects; may cause spontaneous ignition. See also Sandstorm pg. 13. 5-ft./Ess +150°F Unearthly Heat: 1d6 lethal and 1d4 nonlethal damage per round, Heat Metal effect on metal objects. See Sandstorm pg. 12-13. 10-ft./Ess +100°F Extreme Heat: 1d6 lethal damage per minute, 1d4 nonlethal damage per five minutes. See Heat Dangers. 15-ft./Ess +50°F Hot or Severe Heat: See Heat Dangers. Basic Effect : A Shaman gains 10 ft. of Darkvision per point of Essentia invested in the Element of Negative Energy. Crown : The Shaman gains a +4 bonus to Hide and Intimidate skill checks. She gains an additional +2 bonus to each per Essentia invested in the Element of Negative Energy. She may also move at full speed without taking a penalty to her Hide checks. Feet : The Shaman may use Negative Energy-based spells and abilities without them being impeded by planes which impede such magic (such as the Positive Energy Plane). She is further protected from the damage and energy drain effects, respectively, of minor and major negative-dominant planes, though she is not protected from other sources of negative energy damage or energy drain. She may extend these benefits to one creature to whom she has line of effect per point of Essentia invested in the Element of Negative Energy. Hands : The Shaman gains the ability to Rebuke, Command, or Bolster Undead creatures as does an Evil Cleric of her Meldshaper Level. However, she uses Constitution instead of Charisma when using this ability. To use this ability, she must have a number of points of Essentia invested in the Element of Negative Energy equal to the number of previous times she has used this ability today. Arms : The Shaman adds +1 per point of Essentia remaining in the Element of Negative Energy to the saving throw DCs, if any, of Spells that are cast using Essentia from the Element of Negative Energy. Brow : The Shaman gains Lifesense out to 30 ft. per Essentia invested in the Element of Negative Energy. This ability causes a Medium or smaller living creature within its limits to illuminate (in the Shaman's eyes) itself and its surroundings in a radius of 60 ft. For each size category larger than Medium, a living creature's illumination radius doubles (120 ft. for a Large creature, 240 ft. for a Huge creature, and so on to 960 ft. for a Colossal creature). This light functions as normal light that others simply cannot see; this ability does not allow the Shaman to see through solid objects or allow her to see while Blind, though the light may eliminate a creature's ability to hide from her eyes. Invisible creatures still shed light, which makes pinpointing their square possible but does not make it possible to ignore their invisibility. Shoulders : The Shaman may, as a full-round action, become Incorporeal for a number of rounds equal to the Essentia invested in the Element of Negative Energy. If she reduces the amount of Essentia so invested while Incorporeal, its duration decreases accordingly, which may immediately revert her to corporeality. Despite being Incorporeal, she may only enter solid objects so long as she remains adjacent to a free space. She may float upwards while Incorporeal even if she has no Flight speed, but every 5 ft. of vertical movement against gravity counts double against her Land speed. If this effect ends while she is within a solid object, she is shunted to the nearest open square and takes 1d6 damage. Throat : The Shaman gains a breath weapon that affects a 60 ft. line as a Standard Action. Those caught within suffer 1d4 negative levels. It does, however, offer both a Fortitude save to negate and a Reflex save to halve its effect; the DC of each is 10 + half her Meldshaper Level + her Constitution modifier. For each Essentia invested in the Element of Negative Energy, this weapon inflicts another negative level. Undead caught in the breath weapon are instead healed by 5d4 HP + 1d4 per Essentia; for them the weapon's saves are both marked as Harmless. Once used, she must wait 1d4 rounds before using this breath weapon again. Waist : If Negative Energy would otherwise harm the Shaman, she is instead healed by it. If it heals her normally, she becomes immune to energy drain and death effects. Heart : An area within a 10 ft. per Essentia invested in the Element of Negative Energy around the Shaman is filled with swarming motes of darkness, which cover every surface and creature, and fills the air. They often take on the appearance of bats or vermin, but are not actually creatures. Despite this, treat those within as sharing its space with a creature that has the Swarm subtype, deals 1d8 negative energy damage per round, and has the Distraction ability of that subtype, with a DC of 10 + half the Shaman's Meldshaper Level + her Constitution core. This area is also treated as being subject to a Desecrate spell, complete with an altar, but this is not an Evil effect. The Shaman herself gains most properties of the Undead type, and for all effects treats herself as that type, but she retains her Constitution score and does not therefore gain immunity to effects that require a Fortitude save, and also gains a Turn Resistance equal to the Essentia in the Element of Negative Energy. The Shaman is subject to the Swarm's negative energy infusions, but as an Undead creature she is healed by it. Basic Effect : A Shaman heals additional HP per day of rest (or an additional 2 HP per day of complete rest) per point of Essentia invested in the Element of Positive Energy. She must maintain the investment for the entirety of the rest period to claim this benefit. Crown : The Shaman gains a +4 bonus to Heal and Survival skill checks. She gains an additional +2 bonus to each per Essentia invested in the Element of Positive Energy. She may also treat a disease or a wound from Spike Stones or similar as a full-round action. Feet : The Shaman may use Positive Energy-based spells and abilities without them being impeded by planes which impede such magic (such as the Negative Energy Plane). She further cannot be blinded or dazzled by ambient light (such as direct sunlight to a light-sensitive creature, or the brilliance of a major positive-dominant plane), though she is not protected from more targeted abilities (such as the Daylight or Glitterdust spells), and the temporary HP gained on major positive-dominant planes is capped at her total HP, preventing her from being overwhelmed. She may extend these benefits to one creature to whom she has line of effect per point of Essentia invested in the Element of Positive Energy. Hands : The Shaman gains the ability to Turn or Destroy Undead creatures as does a Good Cleric of her Meldshaper Level. However, she uses Constitution instead of Charisma when using this ability. To use this ability, she must have a number of points of Essentia invested in the Element of Positive Energy equal to the number of previous times she has used this ability today. Arms : The Shaman adds +1 per point of Essentia remaining in the Element of Positive Energy to the saving throw DCs, if any, of Spells that are cast using Essentia from the Element of Positive Energy. Brow : The Shaman becomes aware of the relative vitality of creatures around her. She knows roughly how many HD any creature she is aware of and has line of effect to (accurate to the nearest range of five, so a creature with 13 HD would be described as having 11-15 HD). She also knows roughly what percentage of its health it has remaining, including temporary HP (described to the nearest 10%). Any creature that is at 0 HP or below glows in her eyes, allowing her to pinpoint its exact location (it may still have Cover or Concealment, however). Shoulders : The Shaman gains an ability to use an ability similar to an Augmented Astral Caravan, except that she may take a number of passengers equal to the Essentia she has invested in the Element of Positive Energy without their having manifested Astral Traveler. Any passengers who have manifested Astral Traveler may be added for free. If the Shaman removes Essentia such that there is not enough for all passengers, this effect immediately ends for everyone. A Shaman traveling through the Astral Plane in this manner may rebind her Chakras or recombine the Elements as normal, provided she maintains the Positive Element's bind to her Shoulders. If she does not bind it to her Shoulders, this effect immediately ends. Throat : The Shaman gains a breath weapon that affects a 30 ft. cone as a Standard Action. Living creatures caught within are healed for 5d4 HP. For each Essentia invested in the Element of Positive Energy, this healing is increased by 1d4 HP. Any Undead in the region instead take 10d10 damage, plus 2d10 per Essentia. Once used, she must wait 1d4 rounds before using this breath weapon again. Waist : If Positive Energy would normally heal the Shaman, she gains Fast Healing equal to the Essentia invested in the Element of Positive Energy. If it ordinarily harms her, it instead now heals her. Heart : Those within an area 10 ft. per Essentia invested in the Element of Positive Energy around the Shaman are infused with 3d8 points of positive energy per round, plus 2 per Essentia. This is a Healing effect, and harms the Undead. Basic Effect : A Shaman may stand comfortably in cold 5° colder than normal per point of Essentia invested in the Element of Water. She also gains a +1 bonus per point of Essentia so invested on saving throws to avoid damage from thirst. Crown : The Shaman gains a +4 bonus to Concentration and Swim skill checks. She gains an additional +2 bonus to each per Essentia invested in the Element of Water. Feet : The Shaman may use Water-based spells and abilities without them being impeded by planes which impede such magic (such as the Elemental Plane of Fire). She further gains the ability to breathe water and immunity to being crushed by pressure while immersed in a liquid. If made of fire, she gains immunity to damage taken due to being immersed in water or due to being on a water-dominant plane. She may extend these benefits to one creature to whom she has line of effect per point of Essentia invested in the Element of Water. Hands : The Shaman gains the ability to Turn or Destroy Fire creatures as a Good Cleric of her Meldshaper Level turns Undead, and the ability to Rebuke, Command, or Bolster Water creatures as an Evil Cleric of her Meldshaper Level rebukes Undead. However, she uses Constitution instead of Charisma when using this ability. To use either ability, she must have a number of points of Essentia invested in the Element of Water equal to the number of previous times she has used either ability that day. Arms : The Shaman adds +1 per point of Essentia remaining in the Element of Water to the saving throw DCs, if any, of Spells that are cast using Essentia from the Element of Water. Brow : The Shaman gains continuous See Invisibility. She also gains Tremorsense out to 20 ft. per point of Essentia invested in the Element of Water, but only while immersed in a liquid. Shoulders : The Shaman gains a Swim speed of 40 ft. per Essentia invested in the Element of Water. Throat : The Shaman gains a breath weapon that affects a 30 ft. cone as a Standard Action. It deals 10d8 Cold damage, DC 10 + half her Meldshaper Level + her Constitution modifier Reflex save halves. For each Essentia invested in the Element of Water, the damage increases by 2d10. Once used, she must wait 1d4 rounds before using this breath weapon again. Waist : The Shaman becomes immune to the effects of Spells and abilities that have the Cold or Water descriptors (or are based on a Spell that has either of those descriptors), and further becomes immune to cold damage in general. She may also breathe water. Heart : The ambient temperature around the Shaman plummets. In an area within 5 ft. per 2 Essentia invested in the Element of Water, the temperature is literally freezing: temperatures not normally found outside of frostfell regions of the Plane of Water. Creatures within this area take 3d6 Cold damage per round. All metal objects are affected as if by the Chill Metal Spell. Protection against mere cold is insufficient; actual resistance or immunity to cold damage is necessary. In a radius 5 ft. per Essentia, the chill is “merely” unearthly: creatures without serious protection from the cold take 1d6 lethal and 1d4 nonlethal damage per minute from chill alone, and metal objects are still affected as if by Chill Metal. At 10 ft. per Essentia, there is extreme cold, which deals 1d6 lethal damage (no save) and 1d4 nonlethal damage (DC 15 + 1 per previous attempt Fortitude save negates) per minute. Beyond this distance, it can still be uncomfortably cold, but not enough to damage creatures except through extended exposure. Those who take nonlethal damage from the chill suffer from frostbite and hypothermia, and becomes fatigued. The Shaman is unaffected by the cold. Due to the way the Shaman casts Spells, she must invest Essentia in the Element of Water before casting a water-based spell; if, in a single turn, she increases her investment in the Element of Water but then immediately decreases it again by casting a Spell, there is a noticeable drop in temperature in the affected areas, but it is too brief to cause damage. 5-ft./2-Ess -150°F Freezing Cold: 3d6 Cold damage per round, Chill Metal effect on metal objects. 5-ft./Ess -100°F Unearthly Cold: 1d6 lethal and 1d4 nonlethal damage per round, Chill Metal effect on metal objects. See Frostburn pg. 9. 10-ft./Ess -85°F Extreme Cold: 1d6 lethal damage per minute, 1d4 nonlethal damage per five minutes. See Cold Dangers. 15-ft./Ess -50°F Cold or Severe Cold: See Cold Dangers. Air : A Shaman may hold her breath for another 2 rounds per point of Essentia invested in the Element of Air before needing to make Constitution checks. For every 2 Essentia, she may make 10 cu. ft. of air last indefinitely for one creature or significant fire source. Earth : A Shaman gains a +2 bonus per point of Essentia invested in the Element of Earth on saving throws to avoid damage from starvation. Fire : A Shaman may stand comfortably in heat 10° hotter than normal per point of Essentia invested in the Element of Fire. Negative : A Shaman gains 10 ft. of Darkvision per point of Essentia invested in the Element of Negative Energy. Positive : A Shaman heals additional HP per day of rest (or an additional 2 HP per day of complete rest) per point of Essentia invested in the Element of Positive Energy. She must maintain the investment for the entirety of the rest period to claim this benefit. Water : A Shaman may stand comfortably in cold 5° colder than normal per point of Essentia invested in the Element of Water. She also gains a +1 bonus per point of Essentia so invested on saving throws to avoid damage from thirst. Air : The Shaman gains a +4 bonus to Climb and Jump skill checks. She gains an additional +2 bonus to each per Essentia invested in the Element of Air. She also keeps her Dexterity bonus to AC while climbing. Earth : The Shaman gains a +4 bonus on checks to avoid being Bull Rushed, Overrun, or Tripped. She gains an additional +2 bonus to each per Essentia invested in the Element of Earth. She may also avoid losing her Dexterity bonus to AC while balancing as if she had 5 ranks in Balance, though she gains no bonus to that skill. Fire : The Shaman gains a +4 bonus to Diplomacy and Perform skill checks. She gains an additional +2 bonus to each per Essentia invested in the Element of Fire. She may also make a rushed Diplomacy check (as a full-round action) with no penalty. Negative : The Shaman gains a +4 bonus to Hide and Intimidate skill checks. She gains an additional +2 bonus to each per Essentia invested in the Element of Negative Energy. She may also move at full speed without taking a penalty to her Hide checks. Positive : The Shaman gains a +4 bonus to Heal and Survival skill checks. She gains an additional +2 bonus to each per Essentia invested in the Element of Positive Energy. She may also treat a disease or a wound from Spike Stones or similar as a full-round action. Water : The Shaman gains a +4 bonus to Concentration and Swim skill checks. She gains an additional +2 bonus to each per Essentia invested in the Element of Water. Air : The Shaman may use Air-based spells and abilities without them being impeded by planes which impede such magic (such as the Elemental Plane of Earth), and may set her “down” direction while in subjective gravity planes without needing to make a Wisdom check. She may extend these benefits to one creature to whom she has line of effect per point of Essentia invested in the Element of Air. Earth : The Shaman may use Earth-based spells and abilities without them being impeded by planes which impede such magic (such as the Elemental Plane of Air). She may also ignore the crushing effects of being within entirely-solid spaces (such as the Elemental Plane of Earth, or by simply being buried), and may breathe normally while so entombed. This does not give her the ability to tunnel through them, however. She may extend these benefits to one creature within Medium range of her per point of Essentia invested in the Element of Earth. Fire : The Shaman may use Fire-based spells and abilities without them being impeded by planes which impede such magic (such as the Elemental Plane of Water). She also becomes immune to even supernatural ambient heat, including the fire damage of fire-dominant planes, though she does not gain any protection from actual flames or fire-based attacks. Further, any objects she carries or attends are protected from the spontaneous ignition effects of fire-dominant planes. She may extend these benefits to one creature to whom she has line of effect per point of Essentia invested in the Element of Fire. Negative : The Shaman may use Negative Energy-based spells and abilities without them being impeded by planes which impede such magic (such as the Positive Energy Plane). She is further protected from the damage and energy drain effects, respectively, of minor and major negative-dominant planes, though she is not protected from other sources of negative energy damage or energy drain. She may extend these benefits to one creature to whom she has line of effect per point of Essentia invested in the Element of Negative Energy. Positive : The Shaman may use Positive Energy-based spells and abilities without them being impeded by planes which impede such magic (such as the Negative Energy Plane). She further cannot be blinded or dazzled by ambient light (such as direct sunlight to a light-sensitive creature, or the brilliance of a major positive-dominant plane), though she is not protected from more targeted abilities (such as the Daylight or Glitterdust spells), and the temporary HP gained on major positive-dominant planes is capped at her total HP, preventing her from being overwhelmed. She may extend these benefits to one creature to whom she has line of effect per point of Essentia invested in the Element of Positive Energy. Water : The Shaman may use Water-based spells and abilities without them being impeded by planes which impede such magic (such as the Elemental Plane of Fire). She further gains the ability to breathe water and immunity to being crushed by pressure while immersed in a liquid. If made of fire, she gains immunity to damage taken due to being immersed in water or due to being on a water-dominant plane. She may extend these benefits to one creature to whom she has line of effect per point of Essentia invested in the Element of Water. Air : The Shaman gains the ability to Turn or Destroy Earth creatures as a Good Cleric of her Meldshaper Level turns Undead, and the ability to Rebuke, Command, or Bolster Air creatures as an Evil Cleric of her Meldshaper Level rebukes Undead. However, she uses Constitution instead of Charisma when using this ability. To use either ability, she must have a number of points of Essentia invested in the Element of Air equal to the number of previous times she has used either ability that day. Earth : The Shaman gains the ability to Turn or Destroy Air creatures as a Good Cleric of her Meldshaper Level turns Undead, and the ability to Rebuke, Command, or Bolster Earth creatures as an Evil Cleric of her Meldshaper Level rebukes Undead. However, she uses Constitution instead of Charisma when using this ability. To use either ability, she must have a number of points of Essentia invested in the Element of Earth equal to the number of previous times she has used either ability that day. Fire : The Shaman gains the ability to Turn or Destroy Water creatures as a Good Cleric of her Meldshaper Level turns Undead, and the ability to Rebuke, Command, or Bolster Fire creatures as an Evil Cleric of her Meldshaper Level rebukes Undead. However, she uses Constitution instead of Charisma when using this ability. To use either ability, she must have a number of points of Essentia invested in the Element of Fire equal to the number of previous times she has used either ability that day. Negative : The Shaman gains the ability to Rebuke, Command, or Bolster Undead creatures as does an Evil Cleric of her Meldshaper Level. However, she uses Constitution instead of Charisma when using this ability. To use this ability, she must have a number of points of Essentia invested in the Element of Negative Energy equal to the number of previous times she has used this ability today. 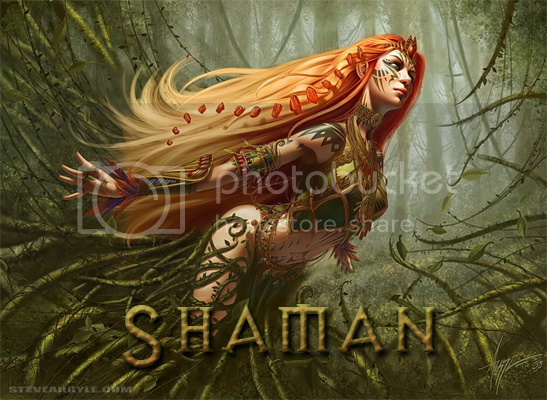 Positive : The Shaman gains the ability to Turn or Destroy Undead creatures as does a Good Cleric of her Meldshaper Level. However, she uses Constitution instead of Charisma when using this ability. To use this ability, she must have a number of points of Essentia invested in the Element of Positive Energy equal to the number of previous times she has used this ability today. Water : The Shaman gains the ability to Turn or Destroy Fire creatures as a Good Cleric of her Meldshaper Level turns Undead, and the ability to Rebuke, Command, or Bolster Water creatures as an Evil Cleric of her Meldshaper Level rebukes Undead. However, she uses Constitution instead of Charisma when using this ability. To use either ability, she must have a number of points of Essentia invested in the Element of Water equal to the number of previous times she has used either ability that day. Air : The Shaman adds +1 per point of Essentia remaining in the Element of Air to the saving throw DCs, if any, of Spells that are cast using Essentia from the Element of Air. Earth : The Shaman adds +1 per point of Essentia remaining in the Element of Earth to the saving throw DCs, if any, of Spells that are cast using Essentia from the Element of Earth. Fire : The Shaman adds +1 per point of Essentia remaining in the Element of Fire to the saving throw DCs, if any, of Spells that are cast using Essentia from the Element of Fire. Negative : The Shaman adds +1 per point of Essentia remaining in the Element of Negative Energy to the saving throw DCs, if any, of Spells that are cast using Essentia from the Element of Negative Energy. Positive : The Shaman adds +1 per point of Essentia remaining in the Element of Positive Energy to the saving throw DCs, if any, of Spells that are cast using Essentia from the Element of Positive Energy. Water : The Shaman adds +1 per point of Essentia remaining in the Element of Water to the saving throw DCs, if any, of Spells that are cast using Essentia from the Element of Water. Air : The Shaman gains the effects of the Touchsight power, but out to 10 ft. per Essentia invested in the Element of Air. Earth : The Shaman gains Tremorsense out to 20 ft. per Essentia invested in the Element of Earth. At-will as a Free Action, the Shaman may reverse the opacity of solid and gaseous objects before her eyes: she is able to see through solid objects with a Hardness less than 20 as if it were clear air, but actual air or other, normally transparent gases become completely opaque. Unless she is literally immersed in solid material, this effectively blinds her, but can be useful in conjunction with other abilities that allow her to burrow. Fire : The Shaman gains the effects of the Arcane Sight spell, but out to a radius of 20 ft. per Essentia invested in the Element of Fire. Negative : The Shaman gains Lifesense out to 30 ft. per Essentia invested in the Element of Negative Energy. This ability causes a Medium or smaller living creature within its limits to illuminate (in the Shaman's eyes) itself and its surroundings in a radius of 60 ft. For each size category larger than Medium, a living creature's illumination radius doubles (120 ft. for a Large creature, 240 ft. for a Huge creature, and so on to 960 ft. for a Colossal creature). This light functions as normal light that others simply cannot see; this ability does not allow the Shaman to see through solid objects or allow her to see while Blind, though the light may eliminate a creature's ability to hide from her eyes. Invisible creatures still shed light, which makes pinpointing their square possible but does not make it possible to ignore their invisibility. Positive : The Shaman becomes aware of the relative vitality of creatures around her. She knows roughly how many HD any creature she is aware of and has line of effect to (accurate to the nearest range of five, so a creature with 13 HD would be described as having 11-15 HD). She also knows roughly what percentage of its health it has remaining, including temporary HP (described to the nearest 10%). Any creature that is at 0 HP or below glows in her eyes, allowing her to pinpoint its exact location (it may still have Cover or Concealment, however). Water : The Shaman gains continuous See Invisibility. She also gains Tremorsense out to 20 ft. per point of Essentia invested in the Element of Water, but only while immersed in a liquid. Air : The Shaman gains a Fly speed with Good maneuverability. Its speed is 20 ft. per Essentia invested in the Element of Air. If no Essentia is, she may hover in midair, but not move herself (except down by falling, which she may control to be as much slower than free fall as she likes). Earth : The Shaman gains a Climb speed equal to her Land speed, and gains a bonus on her Land speed equal to 20 ft. per Essentia invested in the Element of Earth. Fire : The Shaman gains the ability to teleport up to 5 ft. per Essentia invested in the Element of Fire as a Standard Action. She may bring a number of willing creatures that she touches (or who are linked together by touch) equal to the Essentia invested in the Element of Fire. Negative : The Shaman may, as a full-round action, become Incorporeal for a number of rounds equal to the Essentia invested in the Element of Negative Energy. If she reduces the amount of Essentia so invested while Incorporeal, its duration decreases accordingly, which may immediately revert her to corporeality. Despite being Incorporeal, she may only enter solid objects so long as she remains adjacent to a free space. She may float upwards while Incorporeal even if she has no Flight speed, but every 5 ft. of vertical movement against gravity counts double against her Land speed. If this effect ends while she is within a solid object, she is shunted to the nearest open square and takes 1d6 damage. Positive : The Shaman gains an ability to use an ability similar to an Augmented Astral Caravan, except that she may take a number of passengers equal to the Essentia she has invested in the Element of Positive Energy without their having manifested Astral Traveler. Any passengers who have manifested Astral Traveler may be added for free. If the Shaman removes Essentia such that there is not enough for all passengers, this effect immediately ends for everyone. A Shaman traveling through the Astral Plane in this manner may rebind her Chakras or recombine the Elements as normal, provided she maintains the Positive Element's bind to her Shoulders. If she does not bind it to her Shoulders, this effect immediately ends. Water : The Shaman gains a Swim speed of 40 ft. per Essentia invested in the Element of Water. Air : The Shaman gains a breath weapon that affects a 60 ft. line as a Standard Action. It deals 10d4 Sonic damage, DC 10 + half her Meldshaper Level + her Constitution modifier Reflex save halves. For each Essentia invested the Element of Air, the damage increases by 2d4. Those who fail the Reflex save are also blown back by 5 ft. for every 5 by which they failed the save. Once used, she must wait 1d4 rounds before using this breath weapon again. Earth : The Shaman gains a breath weapon that affects a 30 ft. cone as a Standard Action. It deals 10d6 Dessication damage, DC 10 + half her Meldshaper Level + her Constitution modifier Reflex save halves. For each Essentia invested in the Element of Earth, the damage increases by 2d6. Once used, she must wait 1d4 rounds before using this breath weapon again. Fire : The Shaman gains a breath weapon that affects a 60 ft. line as a Standard Action. It deals 10d10 Fire damage, DC 10 + half her Meldshaper Level + her Constitution modifier Reflex save halves. For each Essentia invested in the Element of Fire, the damage increases by 2d10. Once used, she must wait 1d4 rounds before using this breath weapon again. Negative : The Shaman gains a breath weapon that affects a 60 ft. line as a Standard Action. Those caught within suffer 1d4 negative levels. It does, however, offer both a Fortitude save to negate and a Reflex save to halve its effect; the DC of each is 10 + half her Meldshaper Level + her Constitution modifier. For each Essentia invested in the Element of Negative Energy, this weapon inflicts another negative level. Undead caught in the breath weapon are instead healed by 5d4 HP + 1d4 per Essentia; for them the weapon's saves are both marked as Harmless. Once used, she must wait 1d4 rounds before using this breath weapon again. Positive : The Shaman gains a breath weapon that affects a 30 ft. cone as a Standard Action. Living creatures caught within are healed for 5d4 HP. For each Essentia invested in the Element of Positive Energy, this healing is increased by 1d4 HP. Any Undead in the region instead take 10d10 damage, plus 2d10 per Essentia. Once used, she must wait 1d4 rounds before using this breath weapon again. Water : The Shaman gains a breath weapon that affects a 30 ft. cone as a Standard Action. It deals 10d8 Cold damage, DC 10 + half her Meldshaper Level + her Constitution modifier Reflex save halves. For each Essentia invested in the Element of Water, the damage increases by 2d10. Once used, she must wait 1d4 rounds before using this breath weapon again. Air : The Shaman becomes immune to the effects of Spells and abilities that have the Air descriptor (or are based on a Spell that has that descriptor), and further becomes immune to the effects of winds in general. This affects not only herself, but also her equipment and even her attacks: an arrow shot by a Shaman with the Element of Air bound to her Waist would fly true straight through a Wind Wall spell. Earth : The Shaman becomes immune to the effects of Spells and abilities that have the Earth descriptor (or are based on a Spell that has that descriptor), and further may ignore difficult terrain of all forms. Finally, her own square and all squares adjacent to her are considered difficult terrain for other creatures. Fire : The Shaman becomes immune to the effects of Spells and abilities that have the Fire descriptor (or are based on a Spell that has that descriptor). Further, any fire damage she would take (ignoring the above immunity) instead heals her. Negative : If Negative Energy would otherwise harm the Shaman, she is instead healed by it. If it heals her normally, she becomes immune to energy drain and death effects. Positive : If Positive Energy would normally heal the Shaman, she gains Fast Healing equal to the Essentia invested in the Element of Positive Energy. If it ordinarily harms her, it instead now heals her. Water : The Shaman becomes immune to the effects of Spells and abilities that have the Cold or Water descriptors (or are based on a Spell that has either of those descriptors), and further becomes immune to cold damage in general. She may also breathe water. Air : The Shaman becomes surrounded by a raging whirlwind. This cylinder of circling winds is 200 ft. tall, and has a radius equal to 5 ft. per Essentia invested in the Element of Air. All creatures within are treated as being within a tornado, except the Fortitude DC to avoid being sucked up by it is 10 + half the Shaman's Meldshaper Level + her Constitution modifier, and the size of creature that is affected depends on how much Essentia is invested (i.e. how large it is). To be checked, the radius of the storm must be equal to the creature's space; to be knocked down, the radius must exceed the creature's space by 5 ft., and must exceed the creature's space by 10 ft. in order to qualify for Fortitude saves vs. being sucked up. The Shaman is unaffected by the winds, as are her ranged attacks. As a magical windstorm, it is visible but does not provide enough opacity to cause Concealment or break line of sight. Earth : The Shaman can literally cause the earth to rise up beneath her feet, or spontaneously form beneath them even in the most airy of areas. She effectively has a “Flight” speed with Average maneuverability equal to her Land speed, but she is actually just walking as the earth rises to meet her. If she is within 50 ft. per point of Essentia invested in the Element of Earth of an unworked earthen or stone surface, she may cause the earth to rise up to meet her feet, leaving a wall of stone and earth. Otherwise it forms as a simple bridge of earth and stone, appearing from mid-air if necessary. Either form crumbles away behind her a round after it was made (unless she is still standing there), dealing damage as a falling object to those in the squares directly beneath it or adjacent to those squares. Fire : The ambient temperature around the Shaman soars. In an area within 5 ft. per 2 Essentia invested in the Element of Fire, the temperature is literally burning: it is the nearly the temperature found on the Plane of Fire. Creatures within this area take 3d10 Fire damage per round. All metal objects are affected as if by the Heat Metal Spell. Flammable objects may ignite, as on a fire-dominant plane. Protection against mere heat is insufficient; actual resistance or immunity to fire is necessary. Negative : An area within a 10 ft. per Essentia invested in the Element of Negative Energy around the Shaman is filled with swarming motes of darkness, which cover every surface and creature, and fills the air. They often take on the appearance of bats or vermin, but are not actually creatures. Despite this, treat those within as sharing its space with a creature that has the Swarm subtype, deals 1d8 negative energy damage per round, and has the Distraction ability of that subtype, with a DC of 10 + half the Shaman's Meldshaper Level + her Constitution core. This area is also treated as being subject to a Desecrate spell, complete with an altar, but this is not an Evil effect. The Shaman herself gains most properties of the Undead type, and for all effects treats herself as that type, but she retains her Constitution score and does not therefore gain immunity to effects that require a Fortitude save, and also gains a Turn Resistance equal to the Essentia in the Element of Negative Energy. The Shaman is subject to the Swarm's negative energy infusions, but as an Undead creature she is healed by it. Positive : Those within an area 10 ft. per Essentia invested in the Element of Positive Energy around the Shaman are infused with 3d8 points of positive energy per round, plus 2 per Essentia. This is a Healing effect, and harms the Undead. Water : The ambient temperature around the Shaman plummets. In an area within 5 ft. per 2 Essentia invested in the Element of Water, the temperature is literally freezing: temperatures not normally found outside of frostfell regions of the Plane of Water. Creatures within this area take 3d6 Cold damage per round. All metal objects are affected as if by the Chill Metal Spell. Protection against mere cold is insufficient; actual resistance or immunity to cold damage is necessary. Certain of a Shaman's Spells are based upon more than one element, either a pair or a triple. To use these spells, the Shaman must have the appropriate Elemental Combination prepared. See Spellshaping, above, for details on preparing Elemental Combinations. The combinations are listed in Table 2: Elemental Pairings and Table 3: Elemental Triples, below. A “—” indicates that the combination is impossible, either because it would involve combining the Element with itself, or with its opposite. The following Spells may be shaped by the Shaman. Every Shaman knows each of these Spells, and may shape them without needing to prepare them. See Spellshaping, above, for more details. A Shaman's Spells are described somewhat differently from the descriptions used for other Spellcasters' Spells. The differences are explained below. The Shaman's Spell List has a short description of each Spell. The list is broken down into the 9 levels, and further broken down into the 6 elements, 12 pairings, 8 triples, as well as “Universal” and “Varies,” which refer to spells which either have no element (see below), or have an element that depends on how the Spell is shaped (and needs the appropriate amount of Essentia from that element). The “min. Investment” is given as, for example, “(1 Fire, 1 Positive),” indicating that the Spell requires a point of Essentia from each of the Elements of Fire and Positive Energy to the newly-shaped Spell. The Description is for easy reference and look-up purposes only; refer to the full Spell text for exact rules. F The spell requires an expensive focus component. M The spell requires an expensive material component. * For a single-classed Shaman, this spell has a Minimum Requirement larger than its default Essentia capacity. This means that the Shaman must use other effects, most notably Improved Elemental Channeling (which increases the capacity of an Element bound to a Chakra, and therefore increases the capacity of spells tied to that element), to increase the spell's capacity. At character higher levels, this stops being necessary. Shaman Spells do not have alignment descriptors. When a Spell appears on a Shaman's Spell List that has a descriptor normally, the Shaman's version does not. This is a true property of the Spell, not a particularity of the Shaman's casting. Thus, for example, a magic item made by a Shaman using such a spell would also not have such a descriptor. [Negative] — A spell that involves negative energy. Many existing Spells also have this descriptor; however, previous cases typically used the [Evil] descriptor instead. These spells also qualify as having the [Negative] descriptor even when cast by other classes, but retain the [Evil] descriptor except when the Shaman uses them. [Positive] — A spell that involves positive energy. Almost all Conjuration (Healing) Spells gain this descriptor. In addition to the Spell's actual Spell Level, the Level entry in a Spell's description also states which Element or Elemental Combination it falls under. For instance, Dust Devil states not only “Shaman 1st,” but “Shaman 1st / Lava,” indicating that it is a 1st level Spell that requires the Lava Elemental Combination. This entry indicates the minimum Essentia investment required by the Spell. Essentia invested in a Spell at the time of its casting must come from the Essentia previously invested in the element(s) that it is based on. For example, Dust Devil's description notes “Minimum Investment: 1 Earth, 1 Fire” — to cast it, the Shaman must move at least 1 Essentia from the Element of Earth, and 1 Essentia from the Element of Fire, into the newly created Spell. This specialized rearrangement of Essentia is a part of the Spell's Casting Time, and does not require a separate action. Note that Spells which depend on Elemental Combinations may not actually require Essentia from all of the combined elements: they still require that the basis Elemental Combination is currently prepared by the Shaman. Further, a Shaman is not restricted to just the minimum required investment: while shaping the Spell, the Shaman may elect to move as much Essentia from the Spell's base elements into the Spell as will fit (see Spellshaping, above, for Spell capacity rules) and is available. Essentia from other sources, including any uninvested Essentia that the Shaman may have, are not available for the initial investment while shaping the spell (but may be moved there afterward while rearranging Essentia in the normal fashion with a Swift Action). Further, some Spells have no base element. These are considered Universal, and any Essentia invested in them comes from the Shaman's personal pool of uninvested Essentia; the Essentia invested in the elements is not available for their use. Few of them are actually improved by Essentia, however; these tend to function just like their normal counterparts. When rearranging Essentia, all Essentia is available for all receptacles: elements, ongoing Spells, and Soulmelds the Shaman may have, etc. It is only during the initial shaping of the Spell that the Essentia must come from the base element(s). Shaman Spells often have longer Durations than their counterparts cast by other Spellcasters. This is a true property of the Shaman's version of the Spell. Of special note: when Spells that have a Duration of Permanent are shaped, their minimum Essentia must be maintained within the Spell until the next time the Shaman spends an hour preparing her Elemental Combinations and Chakra Binds. At this time, the Essentia in the Spell return to her, because the Spell itself has become stable and maintains its own Essentia reserve equal to the amount of Essentia that had been in it at the time. The Shaman can no longer control the Spell directly, nor can she take Essentia from it, as it has become independent. Some Shaman Spells have a duration of “Permanent (until Essentia is removed).” This is similar in function to “Permanent,” except that the above note does not apply: a Shaman must keep the minimum Essentia invested in the Spell for as long as she wants it to remain. A Shaman may use Spell Completion and Spell Trigger items as normal for a character with her Spell List; that is, for example, she may use a Wand of Inflict Minor Wounds made by a Cleric, since Inflict Minor Wounds appears on her own Spell List. However, she is using the Cleric's version, complete with the [Evil] descriptor: this may affect her alignment as normal for the setting. She may also create magic items with her Spells. Treat the shaping of the Spell for the item to be akin to shaping a Permanent duration spell, as outlined above: she must keep her Essentia invested in it for the rest of the day. Spell Completion and Spell Trigger items that she creates use her versions of the Spell, but have their own Essentia invested in them equal to how much the Shaman invested in them during creation, so their use does not require Essentia. This means that a Good Cleric could use a Wand of Inflict Minor Wounds made by a Shaman without alignment conflict, since Inflict Minor Wounds is on the Cleric's Spell List and the Shaman's version of the Spell does not have the [Evil] descriptor. However, a Shaman must add the amount of Essentia invested in the Spell to the Spell's Caster Level for the purposes of pricing the creation of the item: this frequently means that creating items is more expensive for a Shaman than it would be for other Spellcasters. Detect Incarnum (0 Ess) — Detects Soulmelds and Essentia within 60 ft.
Detect Magic (0 Ess) — Detects Spells and magic items within 60 ft.
Detect Poison (0 Ess) — Detects poison in one creature or object. Endure Elements (1 Ess) — Exist comfortably in hot or cold environments. Read Magic (1 Ess) — Read scrolls and spellbooks. Amplify (0 Ess) — Lowers Listen DC by 20. Blood Wind* (2 Air) — Subject uses natural weapon at range. Deep Breath (1 Air) — Subject's lungs are filled with air. Guidance (0 Ess) — +1 on one attack roll, saving throw, or skill check per Essentia. Updraft (1 Air) — Column of wind lifts you aloft. Foundation of Stone (1 Earth) — +2 AC, +4 bonus to resist bull rush and trip attacks. Magic Stone (1 Earth) — Three stones deal 1d6 damage, gain +1/Essentia enhancement bonus. Know Direction (0 Ess) — You discern north. Animate Fire (1 Fire) — Turn campfire into Elemental. Flare (0 Ess) — Dazzles one creature (-1 penalty on attack rolls) per Essentia. Produce Flame (1 Fire) — 1d6 damage +1/level/Essentia, touch or thrown. Raging Flame (1 Fire) — Fires burn twice as hot, half as long. Slow Burn (1 Fire) — Fires burn twice as long, half as hot. Vitiate, Lesser (1 Negative) — Deals 1 damage/2 Essentia (rounded up) each round. Inflict Minor Wounds (0 Ess) — Touch attack, 1 point of damage. Resistance (1 Positive) — Subject gains +1 on saving throws per Essentia. Stabilize (0 Ess) — Subject becomes stabilized. Vigor, Lesser (1 Positive) — Cures 1 HP/2 Essentia (rounded up) each round. Animate Water (1 Water) — Turn quantity of water into Elemental. Create Water (1 Water) — Creates 2 gallons/level of pure water. Locate Water (1 Water) — Reveals location, size, and quantity of water sources. Wings of the Sea (1 Water) — +30 ft. to subject's swim speed. Shock and Awe (0 Ess) — Flat-footed creatures gain -10 on initiative. Shocking Grasp (1 Fire) — One touch per Essentia delivers 1d6/level electricity damage (max 5d6). Thunderhead (1 Air, 1 Fire) — Small lightning bolts deal 1d6 damage/round, lasts additional rounds with Essentia. Fog Cloud (1 Air, 1 Water) — Fog obscures vision. Obscuring Mist (1 Air) — Fog surrounds you. Stormrunner's Ward* (2 Air, 1 Water) — Add +4 (+1/Essentia) to ship's checks to weather storms. Darkness (2 Negative) — 20-ft./Essentia radius sphere of supernatural shadow. Ebon Eyes (1 Negative) — See even in magical darkness. Nightshield (1 Air, 1 Negative) — You gain a resistance bonus on saves, and spell absorbs magic missiles. Light (0 Ess) — Object shines like a torch. Nimbus of Light (1 Fire, 1 Positive) — Light illuminates until released as an attack. Shield (1 Fire, 1 Positive) — Invisible disc gives +4 to AC, blocks magic missiles. Dust Devil (1 Earth, 1 Fire) — Whirling funnel of hot sand damages and dries out foes. Molten Boulder* (1 Earth, 2 Fire) — Creates rolling ball of magma, 2d6 damage + 1/Essentia, lasts 1 round/level. Sandblast (1 Earth, 1 Fire) — You fire hot sand that deals 1d6 nonlethal damage, stuns enemies. Detect Snares and Pits (1 Earth) — Reveals natural or primitive traps. Golemstrike (1 Earth, 1 Water) — Subject can sneak attack constructs for 1 round/Essentia. Pass Without Trace (1 Water) — One subject/level leaves no tracks. Rapid Burrowing* (2 Earth, 1 Water) — +20 ft. to subject's burrowing speed. Animate AnimalM (1 Negative) — Animate one tiny or smaller animal as skeleton or zombie. Gravestrike (1 Earth, 1 Negative) — Target can sneak attack undead for 1 round per Essentia. Hide from Undead (1 Earth) — Undead can’t perceive one subject/level. Summon Undead I (2 Negative) — Summons an undead to fight for you. Entangle (1 Earth, 1 Positive) — Plants entangle everyone in 40-ft.-radius. Vinestrike (1 Earth, 1 Positive) — Target can sneak attack undead for 1 round per Essentia. Wood Wose (1 Earth, 1 Positive) — Nature spirit does simple tasks for you. Cause Fear (1 Negative) — One creature of 5 HD or less flees for 1d4 rounds. Omen of PerilF (2 Fire, 1 Negative) — You know how dangerous the future will be. Scare (1 Fire, 2 Negative) — Panics creatures of 5 HD or less. Faerie Fire (1 Fire) — Outlines subjects with light, canceling Blur, concealment, and the like. Remove Fear (1 Positive) — Suppresses fear or gives +4 on saves against fear for one subject + one per four levels. Vision of Glory (1 Fire, 1 Positive) — Subject gains morale bonus equal to your Cha modifier to one saving throw. Acid Arrow (1 Negative, 1 Water) — Ranged touch attack; 2d4 damage for 1 round +1 round/extra Essentia. Animate Blackwater (1 Negative, 1 Water) — Turns quantity of water into Elemental infused with Negative Energy. Babau Slime (1 Negative) — Secrete a body-covering acid that damages attacking foes. Curse WaterM (1 Negative) — Makes unholy water. Bless WaterM (1 Positive, 1 Water) — Makes holy water. Delay Poison (2 Positive) — Stops poison from harming subject for 1 hour/level + 1 hour/Essentia. Purify Food and Drink (1 Positive) — Purifies 1 cu. ft./level of food or water. Adept Spirit (1 Ess) — Subject can activate bonus on caster level checks, Will saves, Concentration checks, and Int-based checks for 1 minute. Animal Spirit (1 Ess) — Subject can activate scent, low-light vision, and bonus on Wis-based checks for 1 minute. Avoid Planar Effects (1 Ess) — Provides temporary protection against overtly damaging planar traits. Guardian Spirit (1 Ess) — Subject can activate bonus on AC, Reflex saves, and Dex-based checks for 1 minute. Incarnum Arc (1 Ess) — Movable line deals 1d6 damage +1d6 damage/Essentia. Soul Boon (1 Ess) — Grants subject 1 temporary Essentia per Essentia. Soulmeld Blessing (1 Ess) — Allies can reallocate Essentia for free. Summon Small Elemental (1 Ess) — As Summon Nature's Ally II, but only for Small Elementals. Resist Energy (1 Ess) — Ignores 10 (or more) points of damage/attack from specified energy type. Cat's Grace (1 Air) — Subject gains +4 to Dex for 1 min./level. Gust of Wind (1 Air) — Blows away or knocks down smaller creatures once per round for 1 round/Essentia. Whispering Wind (1 Air) — Sends a short message 1 mile/level. Bear's Endurance (1 Earth) — Subject gains +4 to Con for 1 min./level. Halo of Sand (1 Earth) — Swirling sand grants +1 deflection bonus/3 levels, +1 deflection bonus/Essentia. Soften Earth and Stone (1 Earth) — Turns stone to clay or dirt to sand or mud. Spider Climb (1 Earth) — Grants ability to walk on walls and ceilings. Continual FlameM (1 Fire) — Makes a permanent, heatless torch. Eagle's Splendor (1 Fire) — Subject gains +4 to Cha for 1 min./level. Flaming Blade (1 Fire) — Touch attack deals 1d8 +1/Essentia damage. Fire TrapM,* (2 Fire) — Opened object deals 1d4 fire damage +1/level. Heat Metal (1 Fire) — Hot metal damages those who touch it. Pyrotechnics (1 Fire) — Turns fire into blinding light or choking smoke. Curse of Ill Fortune (1 Negative) — Subject takes -3 penalty on attacks, checks, and saves. Dark Way (1 Negative) — Creates temporary unbreakable bridge supporting up to 200 lb./level. Fox's Cunning (1 Negative) — Subject gains +4 to Int for 1 min./level. Aid (1 Positive) — +1 on attack rolls and saves against fear, 1d8 temporary hp +1/level +1/Essentia (max +10 +1/Essentia). Healing Lorecall (1 Positive) — If you have 5 or more ranks in Heal, you can remove harmful conditions with Conjuration (Healing) Spells. Owl's Wisdom (1 Positive) — Subject gains +4 to Wis for 1 min./level. Bull's Strength (1 Water) — Subject gains +4 to Str for 1 min./level. Chill Metal (1 Water) — Cold metal damages those who touch it. Hydrate (1 Water) — Heals desiccation damage. Pressure Sphere (1 Water) — Water pressure deals 4d6 damage to submerged targets; can conjure water with Essentia. Death Knell (1 Fire, 1 Negative) — Kills dying creature; you gain 1d8 temporary hp +1/Essentia, +2 to Str, and +1 level. False Life (1 Air, 1 Fire) — Gain 1d10 temporary hp +1/level +1/Essentia (max +10 +1/Essentia). Gentle Repose (1 Air, 1 Negative) — Preserves one corpse per Essentia. AuguryM F (1 Air, 1 Positive) — Learns whether an action will be good or bad. Delusions of Grandeur (1 Fire, 1 Positive) — One subject per Essentia thinks it is better than it is. Heartfire (1 Air, 1 Fire) — Subject outlined by fire, take 1d4 damage +1/Essentia per round. Decomposition (1 Air, 1 Negative) — Wounds deal 3 extra points of damage each round. Cloud of Bewilderment (1 Air, 1 Water) — Generates a nauseating 10-ft. cube. Summon Swarm (1 Negative, 1 Water) — Summons swarm of bats, rats, or spiders. Jig of the Waves (1 Positive, 1 Water) — Force creature to dance a jig which causes penalties and forces random movement; +1 round/Essentia. Battle Hymn (1 Air, 1 Positive) — Allies can reroll one Will save/round/extra Essentia. Mists of Myth* (1 Air, 1 Positive, 2 Water) — Conjures golden cloud that inspires allies. Body of the Sun (1 Fire, 1 Negative) — Your body emanates fire, dealing 1d4 fire damage/Essentia. Earthbind (1 Earth, 1 Negative) — Subject creature cannot fly. Tactical Precision (1 Earth, 1 Fire) — Allies gain additional +2 bonus on attack rolls and +1d6 additional damage +1/Essentia against flanked foes. Channel the Mishtai (1 Positive) — Draw a random mishtai's soul into a target creature's body. Mountain Stance (1 Earth, 1 Fire) — One subject per Essentia becomes hard to move. Suppress Paralysis (1 Fire, 1 Positive) — Allows one or more creatures to overcome paralysis or Slow effect. Restoration, Lesser (1 Earth, 1 Positive) — Dispels magical ability penalty or repairs 1d4 ability damage. Briar Web (1 Earth, 1 Water) — Area slows creatures and thorns deal 1 point of damage/Essentia/5 ft. moved. Creeping ColdF (1 Negative, 1 Water) — Creature feels chill that increases with each round. DesecrateM (1 Earth, 1 Negative) — Fills area with negative energy, making undead stronger. ConsecrateM (1 Earth, 1 Positive) — Fills area with positive energy, making undead weaker. Create Food and Water (1 Earth, 1 Water, 1 Positive) — Feeds three humans (or one horse)/level. Entice Gift (1 Earth, 1 Water) — Subject gives caster what it's holding. Greatberry (1 Positive, 1 Water) — 2d4 berries each cure 1d4 HP/Essentia. Attune Form (1 Ess) — Grant creature temporary protection against overtly damaging planar traits. Primal Form* (2 Ess) — You turn into an Elemental, gain some abilities. Protection from Energy* (2 Ess) — Absorb 12 points/level of damage from one kind of energy. Resist Energy, Mass* (2 Ess) — Creatures ignore damage from specified energy type. Weapon of Energy* (2 Ess) — Weapon deals extra energy damage. Air Breathing (0 Ess) — Subjects can breathe air freely. Downdraft (1 Air) — Flying creatures knocked down, stays down with Essentia. Fly* (3 Air) — Subject flies at speed of 60 ft.
Wind Wall* (2 Air) — Deflects arrows, smaller creatures, and gases. Control Sand* (2 Earth) — Raise or lower the level of the sand. Snare (1 Earth) — Creates magic booby trap. Tremor* (2 Earth) — Subject knocked prone. Body Blaze* (2 Fire) — You are surrounded by fire and leave a wall-like trail of flame in your wake. Heatstroke (1 Fire) — Subject creature takes nonlethal damage and becomes fatigued. Flame Arrows* (2 Fire) — Arrows deal +1d6 fire damage, +1/Essentia. Bestow Curse* (3 Negative) — -6 to an ability score; -4 on attack rolls, saves, and checks; or 50% chance of losing each action. Vitiate* (2 Negative) — Deals 1 damage/Essentia each round. Vitiate, Mass Lesser* (2 Negative) Deals 1 damage/2 Essentia each round to several targets. Vigor* (2 Positive) — Cures subject each round for 1 HP/Essentia. Vigor, Mass Lesser* (2 Positive) — Cures several subjects each round for 1 HP/2 Essentia. Corona of Cold* (2 Water) — Aura of cold protects you and damages others. Hypothermia* (2 Water) — Causes 1d6 cold damage/level, fatigue. Standing Wave* (2 Water) — Magically propels boat or swimming creature. Water Breathing (1 Water) — Subjects can breathe underwater. Water Walk* (2 Water) — Subject treads on water as if solid. Call Lightning* (2 Air, 1 Fire) — Calls down lightning bolts (3d6 +2/Essentia per bolt) from sky. Lightning Bolt* (2 Air, 2 Fire) — Electricity deals 1d6/level damage, +2 per extra Essentia. Capricious Zephyr* (2 Air, 1 Water) — Gale-force winds push creatures. Favorable Wind (1 Air) — Produces a strong wind that lasts 10 min./(level+Essentia). Sleet Storm* (1 Air, 2 Water) — Hampers vision and movement. Darkfire (1 Air, 1 Negative) — Dark flames deal 1d6 damage/Essentia, touch or thrown. Blindness/Deafness (1 Air, 1 Negative) — Makes subject blind or deafened. Daylight (1 Air, 1 Positive) — 60-ft. radius of bright light. Suppress Blindness/Deafness* (1 Air, 2 Positive) — Helps subject regain sight/hearing. Wall of Light* (2 Air, 1 Positive) — Creates wall of light, can dazzle creatures. Dehydrate* (2 Earth, 1 Fire) — Deals Con damage to subject. Soul of the Waste* (2 Earth, 1 Fire) — Meld into surrounding sand. Storm Mote* (1 Earth, 2 Fire) — Dust devil of flensing sand. Summon Thoqqua (1 Earth, 1 Fire) — As Summon Nature's Ally III, but only for the Thoqqua. Stone Shape* (2 Earth, 2 Water) — Sculpts stone into any shape. Meld into Stone* (1 Earth, 2 Water) — You and your gear merge with stone. Nature's RampartF (1 Earth, 1 Water) — You mold the terrain to provide fortifications. Spike Growth* (2 Earth, 1 Water) — Creatures in area take 1d4 damage, may be slowed. Animate DeadM,* (1 Earth, 3 Negative) — Creates undead skeletons and zombies. Speak with Dead* (2 Earth, 2 Negative) — Corpse answers one question/Essentia. Plant Growth (1 Earth, 1 Positive) — Grows vegetation, improves crops. Speak with Plants (1 Earth, 1 Positive) — You can talk to normal plants and plant creatures. Spikes* (2 Earth, 1 Positive) — As Brambles, but weapon gains +2 bonus and doubled threat range. Curse of Impending Blades, Mass* (1 Fire, 2 Negative) — Enemies take penalty to AC equal to Essentia. Mind Poison* (2 Fire, 1 Negative) — Your poisonous touch deals Wis damage. Skull Watch* (2 Negative) — Skull shrieks when creature enters warded area. Cloak of Bravery* (1 Fire, 2 Positive) — You and allies gain a bonus on saves against fear. Heroics* (2 Fire, 1 Positive) — Gives +2 bonus on attack rolls, saves, skill checks. Poison* (1 Earth, 2 Negative) — Touch deals 1d10 Con damage +1 per extra Essentia, repeats in 1 min. Stinking Cloud* (2 Earth, 1 Negative) — Nauseating vapors, 1 round/level. Neutralize Poison* (2 Positive, 1 Water) — Immunizes subject against poison, detoxifies venom in or on subject. Suppress Curse* (3 Positive) — Helps subject free themselves of any curses. Suppress Disease* (2 Positive, 1 Water) — Helps to cure all diseases affecting subject. Energy Spheres (2 Ess) Two colored spheres per Essentia attack with or negate acid, cold, electricity, and fire energy. Essentia Lock (2 Ess) — Target can't reallocate Essentia. Guardian Spirit (2 Ess) — Subject can activate bonus on AC, Reflex saves, and Dex-based checks for 1 minute. Lay of the Land (2 Ess) — You gain an overview of the geography around you. Open Least Chakra (2 Ess) — All target to bind to its Crown, Feet, or Hands Chakra. Planar Tolerance (2 Ess) — Provides long-term protection against overtly damaging planar traits. Rend Essentia (2 Ess) — Deal Charisma damage or Essentia damage to foe; gain Essentia. Resistance, Greater (2 Ess) — Subject gains +3 bonus on saving throws. Unbind Chakra (2 Ess) — Sever one Chakra Bind per four Caster Levels; deal 1d6 + 1d6/Essentia damage per Bind severed. Unshape Soulmeld (2 Ess) — One of the target's Soulmelds is destroyed. Contingent Energy Resistance (2 Ess) — Energy damage triggers Resist Elements spell. Dragon Breath (2 Ess) — You choose a dragon type and mimic its breath weapon. Resist Energy, Mass (2 Ess) — Creatures ignore damage from specified energy type. Summon Elementite Swarm* (3 Ess) — Summon an elementite swarm to follow your commands. Summon Medium Elemental* (3 Ess) — As Summon Nature's Ally IV, but only for Medium Elementals. Summon Mephit* (3 Ess) — As Summon Monster IV, but only for Mephits. Air Walk (2 Air) — Subject treads on air as if solid (climb at 45-degree angle). Summon Arrowhawk* (3 Air) — As Summon Nature's Ally IV, but only for Arrowhawks. Wind at Back (2 Air) — Doubles overland speed of subjects for 12 hours. Wings of Air, Greater (2 Air) — Subject's flight maneuverability improves two steps. Burrow, Mass* (3 Earth) — As burrow, but affects 1/level subjects. Land Womb (2 Earth) — You and one creature/level hide within the earth. Spike Stones* (3 Earth) — Creatures in area take 1d8 damage, may be slowed. Summon Xorn* (3 Earth) — As Summon Nature's Ally IV, but only for Xorn. Fire Shield (2 Fire) — Creatures attacking you take fire damage; you're protected from heat or cold. Fire Stride (2 Fire) — Teleport from one fire to another. Summon Flamebrother* (3 Fire) — As Summon Nature's Ally IV, but only for Flamebrother Salamanders. Wall of Fire* (3 Fire) — Deals 2d4 fire damage out to 10 ft. and 1d4 fire damage out to 20 ft. Passing through wall deals 2d6 fire damage +1/level. Life Ward (2 Negative) — Gives immunity to healing spells and positive effects. Negative Energy Aura (2 Negative) — 10-ft. radius surrounding you deals 1 hp/3 levels for 1 round/level. Summon Yellow Musk Creeper* (3 Negative) — As Summon Nature's Ally IV, but only for Yellow Musk Creepers. Death Ward* (3 Positive) — Grants immunity to death spells and negative energy effects. Positive Energy Aura (2 Positive) — 10-ft. radius surrounding you heals 1 hp/3 levels for 1 round/level. Sheltered Vitality (2 Positive) — Subject gains immunity to fatigue, exhaustion, ability damage, and ability drain. Summon Unicorn* (3 Positive) — As Summon Nature's Ally IV, but only for Unicorns. Control Water* (3 Water) — Raises or lowers bodies of water. Creeping Cold, GreaterF (2 Water) — As Creeping Cold, but longer duration and more damage. Hypothermia (2 Water) — Causes 1d6 cold damage/level, fatigue. Rushing Waters (2 Water) — Wave makes bull rush attack. Summon Tojanida* (3 Water) — As Summon Nature's Ally IV, but only for Tojanida. Swim, Mass (2 Water) — As Swim, but one creature/level. Wall of Ice* (3 Water) — Ice plane creates wall with 15 hp +1/level, or hemisphere can trap creatures inside. Arc of Lightning (1 Air, 2 Fire) — Line of electricity arcs between two creatures (1d6/level damage). Thunderlance* (3 Air, 1 Fire) — Lance of force deals 3d6 damage and might dispel force effects. Eye of the Hurricane (2 Air, 1 Water) — Storm pushes creatures, calm at center. Ice Storm* (1 Air, 3 Water) — Hail deals 5d6 damage in cylinder 40 ft. across. Shadow Well (1 Air, 2 Negative) — Subject enters gloomy pocket plane and emerges frightened. Glowing OrbF,* (1 Air, 3 Fire) — Creates permanent magical light; you control brightness. Shadowblast (1 Air, 2 Fire) — Blast of light stuns and damages natives to the Plane of Shadow. Explosive Cascade* (1 Earth, 3 Fire) — Bouncing flame ball deals 1d6/level fire damage. Wall of Sand (2 Earth, 1 Fire) — Swirling sand blocks ranged attacks, slows movement through. Command Plants (2 Earth, 1 Positive) — Sway the actions of one or more plant creatures. Poison Vines* (3 Earth, 1 Positive) — Vines grow and poison creatures stuck within them. Fear (1 Fire, 2 Negative) — Subjects within cone flee for 1 round/level. Battle Hymn* (1 Fire, 3 Positive) — Allies can reroll one Will save/round. Rusting Grasp* (3 Negative, 1 Water) — Your touch corrodes iron and alloys. Panacea (2 Positive, 1 Water) — Removes most afflictions. Murderous Mist (1 Air, 2 Negative, 1 Fire) — Steam deals 2d6 damage, blinds creatures. Contagious Touch* ((2 Air, 2 Negative, 1 Water) — You infect one creature/round with chosen disease. Giant Vermin (2 Negative, 2 Water) — Turns centipedes, scorpions, or spiders into giant vermin. Miasma of Entropy* (1 Air, 2 Negative, 1 Water) — Rot all natural materials in 30-ft. cone-shaped burst. Delay Death* (2 Air, 2 Positive, 1 Water) — Losing hit points doesn't kill target. Consumptive Field* (1 Earth, 2 Fire, 2 Negative) — Draw life from all creatures in 30-ft. radius with −1 or fewer hit points. Spark of Life (3 Positive) — Undead creature loses most immunities. Blight* (2 Earth, 2 Negative, 1 Water) — Withers one plant or deals 1d6/level damage to plant creature. Repel Vermin* (1 Earth, 2 Positive, 2 Water) — Insects, spiders, and other vermin stay 10 ft. away. As Animate Dead, except as above and that the material component is only 10 gp worth of black onyx. Unlike most Permanent Spells, neither Dispel Magic nor other forms of removing or suppressing magic works on the animated creature (as if it was Instantaneous). As normal for Animate Fire (Spell Compenium pg. 12), except as noted above and that for each additional Essentia beyond the minimum invested in the Spell, the Fire Elemental grows in size by one size category. As normal for Animate Water (Spell Compendium pg. 13), except as noted above and that for each additional Essentia beyond the minimum invested in the Spell, the Water Elemental grows in size by one size category. As Animate Water (above), except as noted above and that all of the Water Elemental's attacks do an additional 1d6 negative energy damage, plus an additional 2 negative energy damage per Essentia beyond the minimum invested in the spell. Manipulating heat and earth, the Shaman produces a small funnel of whirling sand, scouring and desiccating all it touches. Creates a tightly-localized windstorm, like a small tornado, in the target location. The size of this storm depends on the Essentia invested in it: with the minimum 2, it fills a 5 ft. square. For every additional Essentia, it grows in size by 5 ft., filling a cylinder with the appropriate radius. The cylinder's height depends on the environment, but if there is no ceiling it can be assumed to be as tall as it needs to be. If it moves under a ceiling or shelf, its height is cut off (it may exist under overhangs or even in completely interior spaces). Creatures within the space of the storm take 1d6 damage per 2 Essentia; this damage is half bludgeoning/piercing (DR applies), and half desiccation damage. A creature of the Earth subtype only takes half damage; against a creature with the Plant type or Water subtype, the desiccation damage is doubled. A successful Reflex save allows a creature to jump 5 ft. if doing so allows it to escape the storm; if it does, it only takes half damage. Any desiccation damage causes dehydration; a successful Fortitude save prevents this. The Shaman may move this storm as a swift action; this swift action may also be spent rearranging Essentia and/or manipulating other Spells. The storm may be moved 10 ft. per Essentia invested in it. All those in its path are affected by it as normal. This Spell functions exactly as Flaming Sphere, except that it deals 1d8 fire damage, 1d4 bludgeoning damage (DR applies), plus 1 fire damage and 1 bludgeoning damage per Essentia. It also may be moved as a Swift Action each round; this Swift Action may also be used to redirect other Shaman Spells that are redirected as a Swift Action, and/or to rearrange Essentia. With a touch, the Shaman infuses the beast with dark, coruscating energy that saps their very essence. Each round, the subject is harmed for 1 negative energy damage per 2 Essentia (rounded up). If the subject is Undead, however, this Spell instead heals for the same amount each round. The effects of multiple Vitiate-derived spells do not stack: instead, apply the greatest damage/healing each round. A fine mists envelopes your gallant allies; like the legends you are, you become figures of mystery. For while you can see your own destiny clearly, your foes cannot begin to comprehend what they face. This Spell produces a cloud of mist that blocks vision. Creatures within 5 ft. through the mist have Concealment, and those through more mist than that have Total Concealment. However, you and up to one ally per Essentia can see through this mist normally, taking none of these penalties. As normal for Pressure Sphere (Stormwrack pg. 120), except that it may conjure water to affect creatures out of the water. When used in this fashion, this Spell also counts as a Conjuration (Creation) Spell. The water is created and held into the shape of a floating sphere large enough to engulf a Tiny or smaller creature; its size increases sufficiently to engulf a creature of one size category larger per Essentia beyond the minimum. However, because there is less water available, a sphere of water just barely capable of engulfing a creature of a given size only deals 2d6 damage. This increases by 1d6 damage per size category larger than necessary that the sphere is (max 4d6). The Spell has no effect on creatures too large for the sphere. When used on creatures out of water, it can only damage one creature, or multiple adjacent creatures but then it damages each as if they were a creature of the size appropriate to the space they take up. The sphere of water may be moved through the air, 30 ft. per round, as a Swift Action. This Swift Action may also be used to redirect other Spells, and/or to rearrange Essentia. Against creatures that are actually submerged, this Spell functions as normal. However, its area grows 5 ft. in radius per Essentia invested in the spell beyond the first, and it persists for the duration and the area of effect can be moved about as if it were the sphere of conjured water. As Summon Nature's Ally II, but only Small Elementals may be summoned. The Essentia for this Spell must come from the element matching the Elemental to be summoned. An additional Elemental of the same type is summoned for each Essentia in this Spell beyond the minimum; if the amount of Essentia changes, the shaper may choose which Elementals disappear, or where new Elementals are summoned (newly summoned Elementals are summoned into the same 30-ft. diameter circle that contained the original(s)). This Spell counts as Summon Nature's Ally II or Summon Monster III for the purpose of prerequisites, but only if the prerequisite does not specify the ability to summon a non-Elemental creature. Being able to cast this spell does not qualify as “Ability to cast 3rd-level spells.” Abilities that can modify Summon Nature's Ally II and/or Summon Monster III when used to summon a Small Elemental may be used to affect this Spell in the same way. As Remove Paralysis except as above, and that it does not immediately cure all paralysis and Slow effects currently affecting the subject. Instead, it suppresses their effects, and each round the subject must make a new saving throw against any such effects still affecting him. If he succeeds on the save, that effect is gone, permanently (unless he becomes re-affected). Any effects he has not succeeded on a save against still affect him once this Spell ends. He gains a bonus on these saving throws equal to twice the Essentia invested in this Spell beyond the minimum. This Spell immediately ends if the subject is not suffering from any effects that it covers. As normal for Animate Dead, except that, as noted above, the duration is Permanent, not Instantaneous. This follows the normal rules for Permanent Shaman Spells: she must maintain at least the minimum level of Essentia in the animated corpse until the next time she spends an hour combining elements and binding Chakras, at which point the Essentia is freed and the creature remains animated. Unlike most Permanent Spells, neither Dispel Magic nor other forms of removing or suppressing magic works on the animated creature (as if it was Instantaneous). As normal Blindness/Deafness, except that unlike most Permanent Spells as shaped by a Shaman, the subject must make a second saving throw after 10 rounds; if it fails, the Essentia in the Spell is returned to the Shaman then, as if she had spent an hour combining elements and binding Chakras. If the saving throw is a success, another saving throw is attempted every 10 rounds, or until the Shaman spends an hour combining elements and binding Chakras. Each round counts as an extra round for each Essentia invested in this Spell beyond the minimum. For example, if this Spell has 3 Essentia in it, each round actually counts as 2 rounds towards the 10 round limit, and if that level of investment was maintained, the subject would make a saving throw every 5 (actual) rounds. As Summon Nature's Ally III, but only a Thoqqua may be summoned. An additional Thoqqua is summoned for each Essentia in this Spell beyond the minimum; if the amount of Essentia changes, the shaper may choose which Thoqquas disappear, or where new Thoqquas are summoned (newly summoned Thoqquas are summoned into the same 30-ft. diameter circle that contained the original(s)). This Spell counts as Summon Nature's Ally III for the purpose of prerequisites, but only if the prerequisite does not specify the ability to summon a creature other than the Thoqqua. Abilities that can modify Summon Nature's Ally III when used to summon a Thoqqua may be used to affect this Spell in the same way. As Remove Blindness/Deafness except as above, and that it does not immediately fix all blindness or deafness. Instead, it allows the subject to see and hear while the Spell is in effect, and each round allows the subject must make a new saving throw against the original source of the blindness or deafness. If he succeeds on the save, he is once again able to see and hear on his own, permanently (unless he becomes re-blinded or re-deafened). Any source of blindness or deafness that he has not succeeded on a save against still affect him once this Spell ends. He gains a bonus on these saving throws equal to twice the Essentia invested in this Spell beyond the minimum. This Spell immediately ends if the subject is capable of sight and hearing. As Remove Curse except as above, and that it does not immediately cure all curses affecting the subject. Instead, it suppresses their effects, and each round the subject must make a new save against any curses still affecting him. If he succeeds on the save, that curse is gone, permanently (unless he becomes re-cursed). Any curses he has not succeeded on a save against still affect him once this Spell ends. He gains a bonus on these saving throws equal to twice the Essentia invested in this Spell beyond the minimum. This Spell immediately ends if the subject is not suffering from any curses. As Remove Disease except as above, and that it does not immediately cure all diseases affecting the subject. Instead, it suppresses their effects (including incubation, so time spent suppressed does not count as time under the disease's effect), and each round the subject must make a new Fortitude save against any diseases still affecting him. If he succeeds on the save, that disease is gone, permanently (unless he becomes re-infected). Any diseases he has not succeeded on a Fortitude save against still affect him once this Spell ends. He gains a bonus on these saving throws equal to twice the Essentia invested in this Spell beyond the minimum. This Spell immediately ends if the subject is not suffering from any diseases. As Lesser Vitiate, except as noted above and that it deals 1 negative energy damage per Essentia, rather than per 2 Essentia. As Lesser Vitiate except that, as noted above, it affects multiple creatures. The Elves of Aerenal have a somewhat unique interaction with their ancestors, since the Undying Court are actual physical beings that can be found in the City of the Dead. The benefits remain much the same, but some details are different. To take these substitution levels, one must be an Aerenal Elf about to take the 1st or 5th levels of Shaman. As the Ancestral Counsel class feature that it replaces, the Deathless Counsel feature allows you to gain some benefits from your ancestors. However, rather than being a ritual performed at a site sacred to your 'tribe', you must visit the City of the Dead and petition such attention. This may not take 24 hours, depending on how urgent the Councilors deem your request, but at low levels it easily could be a full day before you are actually heard. Nonetheless, your ancestors will endeavor to help you as they are able, just as with the Ancestral Counsel class feature. An Aerenal Elf Shaman still gains Incarnum Spellshaping (Magic of Incarnum pg. 38) as a bonus feat. An Aerenal Elf also gains the Right of Counsel feat (Eberron Campaign Setting pg. 59-60) as a bonus feat at 1st level. This may be used in conjunction with the Deathless Counsel, though the benefits being requested are somewhat different. An Aerenal Elf gains a Deathless Guide instead of an Ancestral Guide. Rather than being some vague relation of yours who has been sent to help you, this is an incorporeal projection of your particular ancestor back in the City of the Dead. This projection has the Deathless type instead of the Undead type, but is otherwise identical to the Ancestral Guide. You are quite welcome to! Yes, it's incomplete; I wanted to test the lower-level spells before moving it up. Sadly, the game I was playing a Shaman in died before I could get much test data. One thing I'd been thinking of was to eliminate the limited durations on the Shaman's spells (just maintain Essentia), but greatly increase most of the cast times and allow them to be moved around. Possibly with an Artificer-style limited speed-up thing.